Each Apple product comes with the USB cord and the USB Power Adapter separately, and thus there is no separate travel charger provided by Apple because one can attach both to use it as a charger, making it easy for the dual purpose. But for someone who has got both Apple iPad, iPhone and even any other handheld iOS device, the USB Power Adapters can be confusing and one has to always use the appropriate adapter provided by Apple. Using different adapters would sometimes slow down the charging of the device, and many a times can slowly start hurting the battery life of the Apple products. Below is the list of the Apple USB Power Adapters with the device list which they are made for. Do a thorough check and confirm before purchasing a USB power adapter for your iPhone or iPad online. 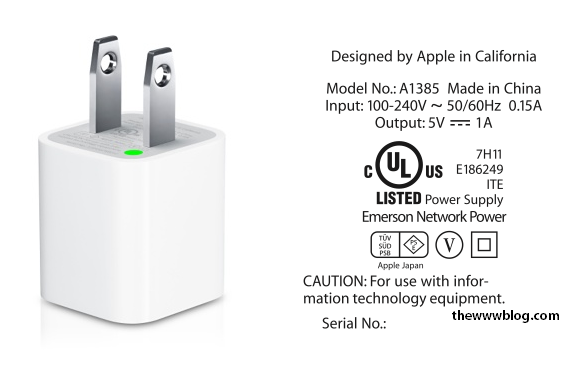 The 10W USB Power adapter from Apple, modeled A1357 is used for charging the Apple iPad and most of the iPhone and iPod models. The Intelligent IC chip would recognize that the battery is fully charged, and switches the device to the saver mode where the overcharging of the device can be prevented. This is a lower power, 5W power adapter that works for charging all the iPhone models, and only the iPad Mini from Apple and it is not suitable for the larger iPad devices. It would directly work with the dock or with the lightning connector to charge the various devices, i.e. the lightning connector in the iPhone 5 and the iPad Mini. This is a high power USB power adapter which has a capacity of 12W and it is suitable for the charging of all the Apple iPad and iPhone models. This has a compact design with the side pin which can be pushed into the charger to make a squarish size, saving more space. Apart from the iPhone and iPad, the iPad Mini can also be charged. Another 5W charger adapter which would charge all the Apple products except the iPads. It’s the model no. A1399, and it is another low power charger from Apple. It is always suggested to charge your device from the direct power source rather than the sources like computers etc. where the correct power is not always maintained. If an Apple iPad is connected to a computer that’s turned off or is in sleep or standby mode, the iPad battery will continue to drain. The “Not Charging” notification appears near the battery status usually on the iPad when the USB 2.0 source is connected to the computer for transferring the files or syncing the device. This is not a warning message, but would let you know that this is not an appropriate source for charging the device.